Here at The Rhinestone Housewife we love our four legged family members. And we love them to smell as clean and fresh as we do. In the rainy and damp Pacific Northwest that can be harder than it sounds. When I stumbled upon Three Sisters Apothecary and they dog soaps I just knew we had to offer them in the shop. These are presented doubled boxed with an adorably packaged paw print cut out inner sleeve. 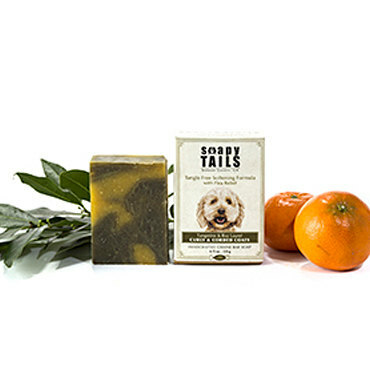 Tart Tangerine and Aromatic Bay Laurel are ideal for Eddie when blended with natural botanicals, gourmet plant oils and butters to replenish and nurture his active coat. Super rich with fluffy lather, this bar gently removes daily dirt accumulation while rinsing easily away. Eddie, a ranch dog has a coat with extreme curl that soils easily and can tangle if not groomed often causing matting. Whether the coat is kept short or long, this unique formula naturally keeps his curls tangle free. Blended to address dryness and frizz common with curly coats, it conditions and detangles naturally. Key actives support his healthy canine coat and skin while providing daily flea relief. 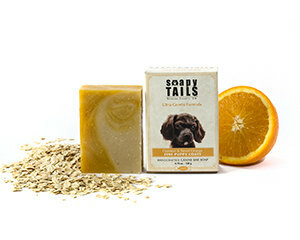 Gentle Oatmeal, Sweet Orange and Coconut Milk are ideal for a small puppy like Coco-Bleu when blended with natural botanicals, gourmet plant oils and butters to nurture her delicate coat. Super rich with fluffy lather, this bar gently removes daily dirt accumulation while rinsing easily away. 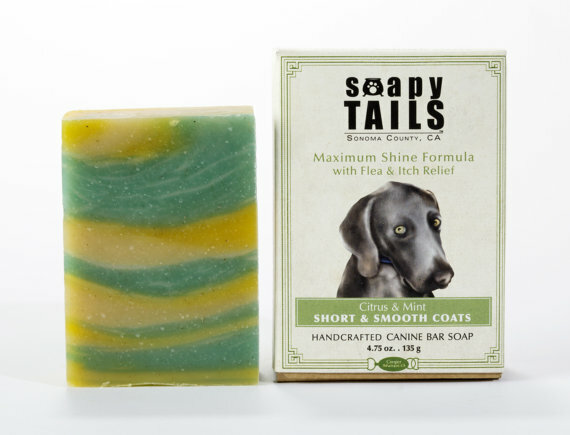 Coco-Bleu’s coat is new and requires an ultra-gentle and pure soap to cleanse and hydrate leaving her coat soft and lush. 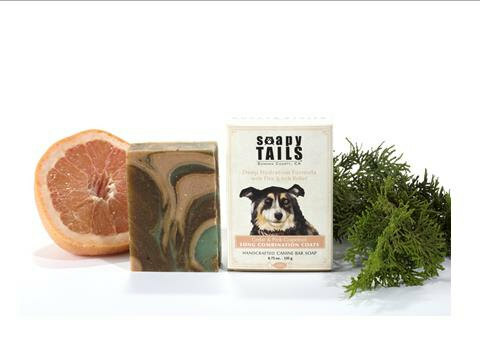 Blended to freshen and support this adventuresome puppy, it keeps her naturally clean and sweet smelling. Key actives support her healthy puppy coat and skin while providing daily flea relief. Cooper prefers Citrus and Mint blended with natural botanicals, gourmet plant oils and butters to replenish and nurture his active coat. Super rich with fluffy lather, this bar gently removes daily dirt accumulation while rinsing easily away. Coats like Cooper’s can be coarse and close to the body and subject to naturally occurring body oils that can result in odor and shedding. This unique formula protects Cooper’s delicate skin beneath his short coat while promoting maximum shine. Blended to restore natural luster, it deeply moisturizes to relieve itching caused by dryness. Key actives support a fresh healthy canine coat and skin while providing flea relief. 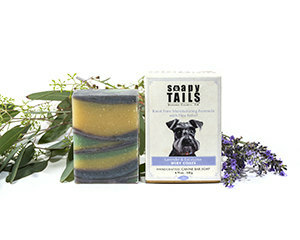 Lavender and Eucalyptus are ideal for Zoe when blended with natural botanicals, gourmet plant oils and butters to replenish and nurture her active coat. Super rich with fluffy lather, this bar gently removes daily dirt accumulation while rinsing easily away. Zoe’s coat is wiry and knots easily if not frequently groomed leading to matting and hot spots. This unique formula naturally detangles both her wiry top coat as well as her soft dense undercoat. Blended to revitalize wiry hair on both the body and face, it conditions and detangles naturally. Key actives support her healthy canine coat and skin while freshening and providing daily flea relief. Coco prefers Cedar & Pink Grapefruit with natural botanicals, gourmet plant oils and butters to replenish and nurture her active coat. Super rich with fluffy lather, this bar gently removes daily dirt accumulation while rinsing easily away. Coats like Coco’s can be especially cumbersome with a shorter undercoat and a longer top coat. Seasonal shedding means that this coat needs to be conditioned naturally to keep it tangle free and soft. This unique formula protects Coco’s coat and skin while hydrating the individual strands. Blended to restore natural luster in any season, this formula meets the needs of this active dog. Key actives support healthy her canine coat and skin while providing flea relief.